Inspired by an ancient armillary sphere, Equinox features concentric, pivoting rings to create an infinite variety of positions. A central glass shade provides bright illumination that is both beautiful and practical. This fixture is designed to be used singly or in series over a dining table, kitchen island. Featuring softly diffused alabaster glass on a finely crafted frame, this style blends well with today's home fashion. The sleek, brushed metallic finish adds warmth and visual interest to create a distinguished appearance. Casual with a modern flair to provide the perfect accent to your decor. Galley is a simple modern form that complements both coastal dicor and commercial style kitchens. The arched supporting frame features overscale metal turnings for an enhanced sense of architectural styling. The linen shades are comprised of rich, satin lining for the feel of a tailored fit and finish to complement the multi-light cluster. The Illuma-Flex monorail track system offers unparalleled simplicity and flexibility for general and accent lighting. The flexible track can be shaped and curved into almost any desired shape to form a truly unique creation. Combine spot lights and colourful pendants to dramatically light your space and enhance any room. Accessory transformers, hanging systems and connectors sold separately. Marchi is an eclectic arrangement of gleaming metal turnings, which recreates the vintage styles found in Parisian neighborhood markets. Polished Nickel elements are combined with a luxurious sheer silver organza shade and clear K9 glass elements. Coordinate with Nissi or Caress collections to create a truly distinctive addition to your home. 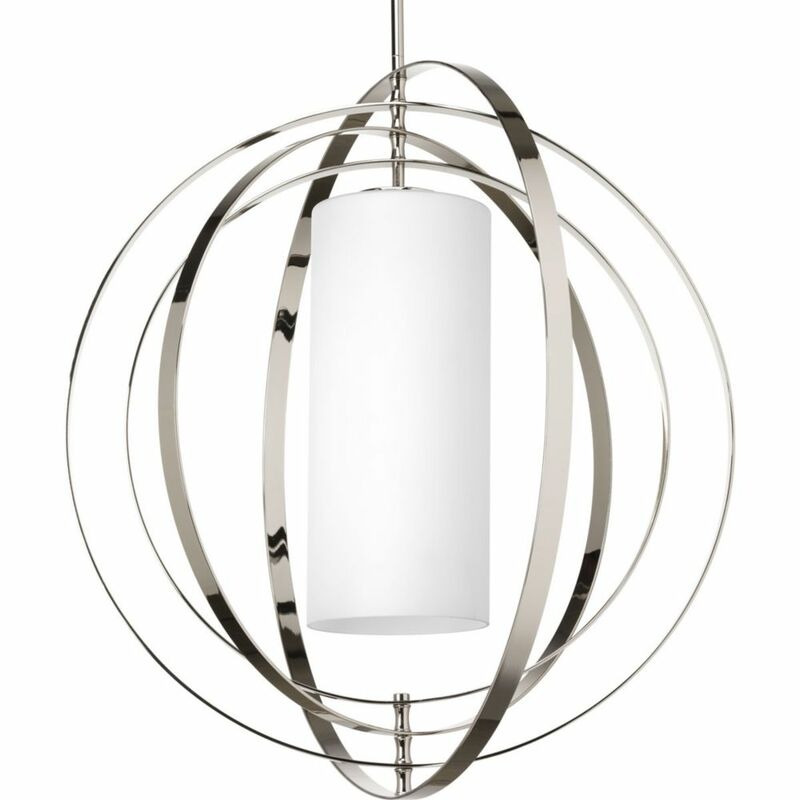 Equinox Collection 1-Light Polished Nickel Pendant Inspired by an ancient armillary sphere, Equinox features concentric, pivoting rings to create an infinite variety of positions. A central glass shade provides bright illumination that is both beautiful and practical. This fixture is designed to be used singly or in series over a dining table, kitchen island.